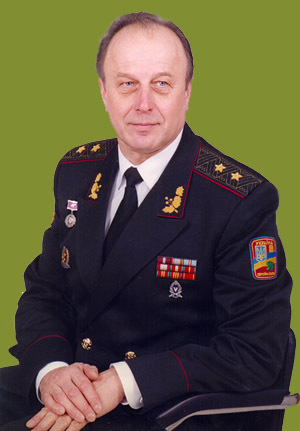 Vladimir V. Pasko – scientist in the field of social medicine and health care organizations of the Armed Forces, MD (2002), Professor (2002), Lieutenant General Medical Service (2001), Honored Doctor of Ukraine, member of the National Union of Writers of Ukraine. Born October 10, 1946 in the village of Velyki Birky (Ternopil district, Ternopil region). In 1971 he graduated from the Military Medical Academy named by S.M.Kirov (VMedA) in Leningrad (now – St. Petersburg). Served in the Airborne Troops as surgeon of the regiment, as adjunct of VMedA he studied the organization of medical support of the Armed Forces (1972-1975), worked as researcher and teacher of the Academy (1975-1982). Held the post of Chief of Medical Service of motorized infantry division (1982-1984), which operated within a limited contingent of Soviet troops in Afghanistan. In the years 1984-1992 again lecturer and senior lecturer (associate professor) of the Military Medical Academy in Leningrad. Since 1992 was in leadership positions in the Armed Forces of Ukraine, since 1995 headed the newly created Ukrainian Military Medical Academy. From February 2005 to December 2006 served as Deputy Minister of Defence of Ukraine. Since 2006 – Professor of Ukrainian Military Medical Academy. PhD thesis "Organization of medical support units and formations limited contingent of Soviet troops in Afghanistan to combat" defended in 1987, Doctor thesis – "Scientific basis of training and human resources of military medicine in Ukraine" in 2002 defended the National Medical University. Author of over 60 published scientific papers and 15 publications of public and military-patriotic direction. Initiator and a senior co-author of Ukraine's first modern Russian-Ukrainian dictionary of military-medical terminology, including explanatory terms to 1.5 thousand, and the Russian-Ukrainian-English alphabetical listing of military and extreme medicine. Editor of scientific-practical journal of the Ministry of Defense "Military Medicine of Ukraine". in 2004 – "Time of truth" (reprinted in 2005).